A delicious mess in 3...2...1. Happy New Year! 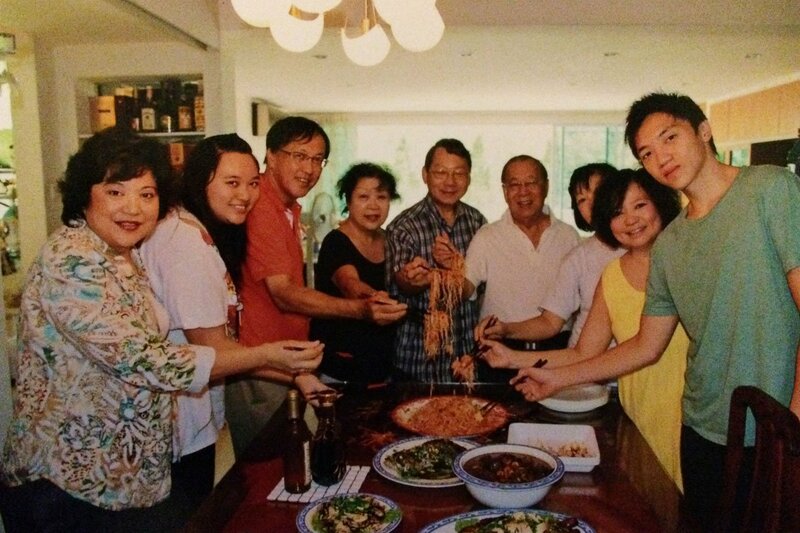 All photos by Becky Cheang, who is second from left in this adorable family shot. 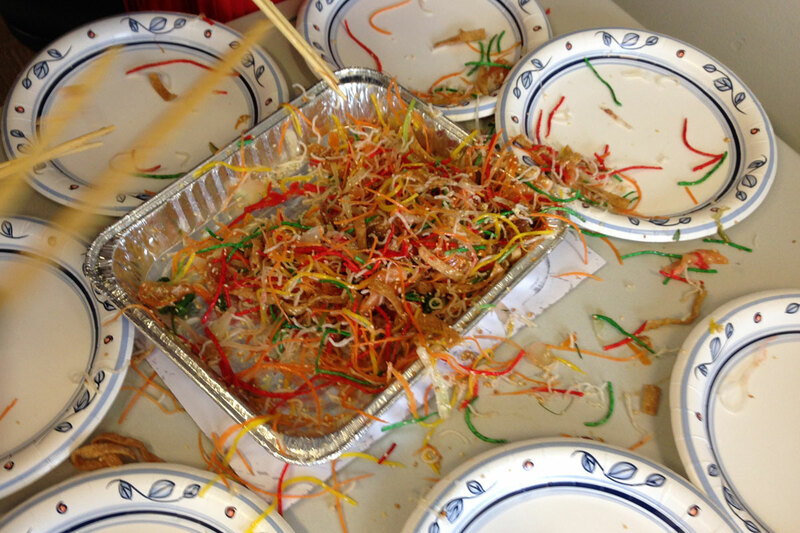 Fathom editorial assistant Becky Cheang is making a mess in Singapore for Chinese New Year. She shares the beautiful art of preparing Prosperity Salad for a tasty toss of good fortune this holiday season. 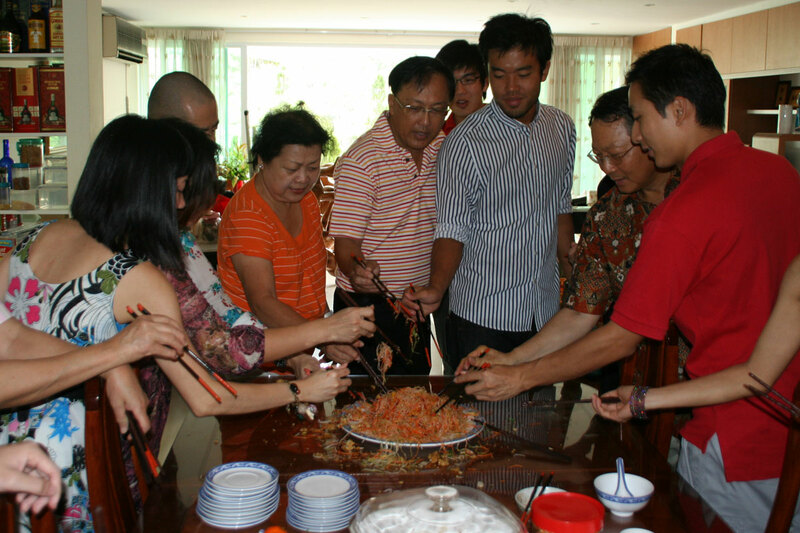 SINGAPORE – Chinese New Year in Singapore is like Thanksgiving, Hanukkah, Christmas, and New Year’s rolled into one, with triple the food, none of the presents, and spread out over three weeks. It can be a little overwhelming. The weeks of complicated preparations needed, the wrangling to get grandparents and the eldest kid (me) to help organize everything, and so many traditions to observe. I mean, you don't want to gravely insult my grandmother by wearing blue on the first day of Chinese New Year. My memory has to work overtime, and I end up wishing I had Minority Report-like technology so I could scan an unfamiliar face and immediately identify which twice-removed-cousin's grand-aunt's son-in-law is giving me $2 in a red packet. 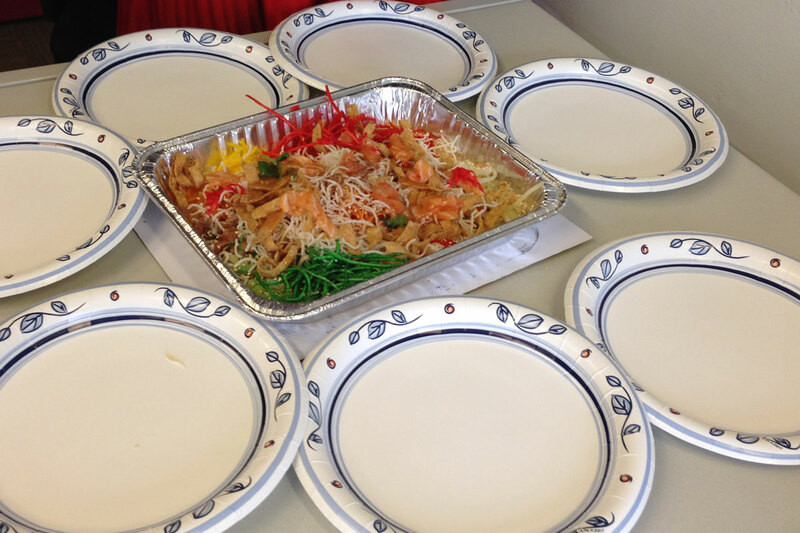 Of course, the highlight of Chinese New Year, as with any proper celebration, is the food. If you think you overeat at Thanksgiving, you might be interested to note that my family is still trying to get through our last box of Chinese New Year treats in August, seven months after the actual holiday. Of the countless dishes we eat during the season, my favorite will always be yu sheng 鱼生, also known as the Prosperity Salad. Yes, my favorite thing to eat during the biggest holiday season of the year is a salad. But it's not just a salad. Yu (鱼) means "fish," one of the main ingredients in the otherwise vegetarian dish. Yu is also a homonym for "abundance"(余). Sheng (生) means "life." The salad carries auspicious meaning and wishes for abundant life, which is why businessmen were the first to spread the tradition into Malaysia and Singapore. My mom recalls first having it when she was in primary school when my grandparents had just started a business. My paternal side is Cantonese, so we sometimes also refer to tossing of the salad as lo hei (撈起), which means to rise – again, a reference for thriving business or wealth. Yu sheng is traditionally tossed with family or friends on the seventh day of Chinese New Year, ren ri, which means "everybody's birthday. (Yes, I get to celebrate my birthday twice a year.) 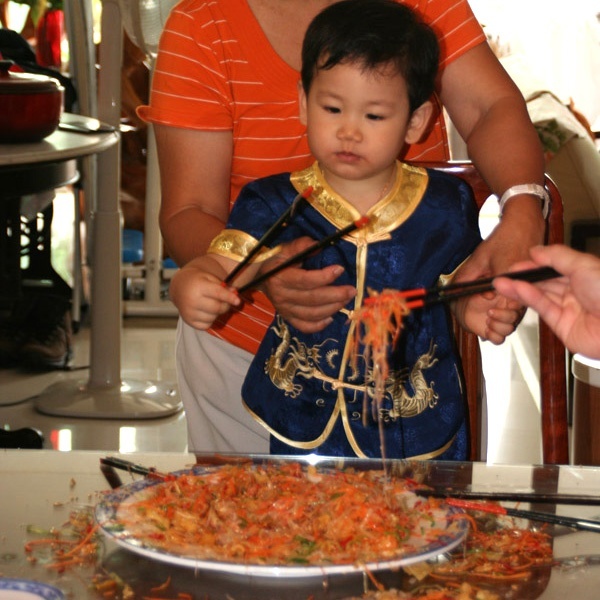 But for as long as I remember, my family has been tossing it on the first and last day (the 15th) of Chinese New Year. As I grew older, I started tossing with friends. This meant during any given year, I would yu sheng at least three times. My record one year was eight. When I was a kid, I loved yu sheng because it was a rare time my parents not only allowed but in fact encouraged me to make a mess. According to superstition, the more the salad overflows from the plate, the more your abundance overflows in life. The salad contains more than twenty ingredients, including shredded vegetables (carrots, turnip, radish), raw fish (usually salmon), pomelo, pickled ginger, crushed nuts, spices, sauces, and crackers. A set typically feeds ten to fifteen, and my family always buys at least two of them. In Singapore, preparing the full salad set is the exception. Supermarkets start selling sets two weeks before Chinese New Year and many restaurants serve their own variations. I know a family that does the set and prepares extra vegetables for a much needed detox after all the heavy eating. If it isn't clear by now, you don't eat yu sheng, you have to do it. This is food as participatory sport. Traditionally, there's an order to preparing the salad, with auspicious Chinese idioms that have to be said as their corresponding ingredients are presented, but my family was never particular about this. We just dive straight into the toss, gathering around a big plate where all the ingredients are laid out. 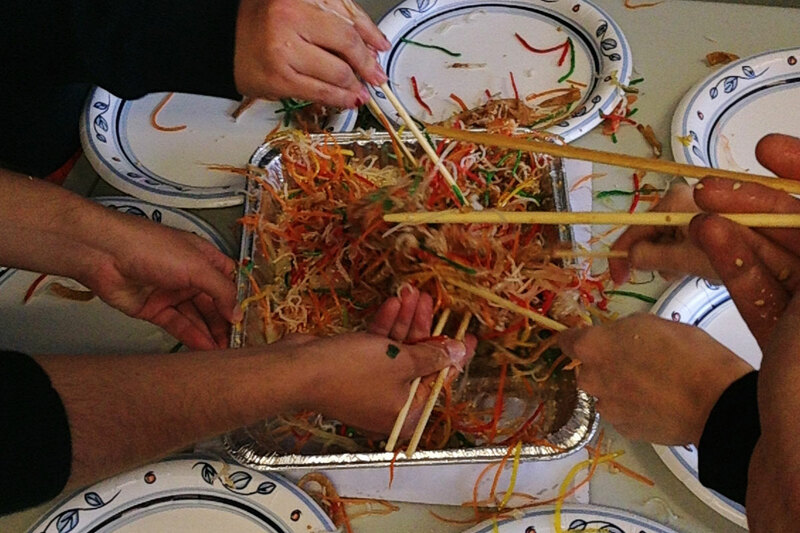 The eldest in the group dives in with chopsticks first, and then everyone joins in, tossing the salad as high as possible while shouting out Chinese idioms of well-wishes and good fortune. This is why I love doing yu sheng so much. It's an occasion for the whole family to gather together to shout out wishes, dreams, plans, and hopes for the year ahead. When I moved to New York City from Singapore two years ago, I was unsure how I'd handle the holiday without my family. But I was thrilled to discover that Nonya and The New Malaysian Restaurant in Manhattan offers it every season to eat in or take out. I bought a set from Nonya last year and introduced it to Team Fathom. And, well, we've had a good year. I'm back home for this new year, but no matter where I may be, mom will always throw in some well wishes for me. Tossing the salad in the Fathom offices, before, during, and after. Photos by Berit Baugher. The ingredients vary and you can change the ratios as much as you want, but here's the easiest breakdown. Usually salmon. My grandmother likes to cook it a little bit to be safe. Some families use abalone instead. Green radish, white radish, carrots, turnips, cabbage, and red pepper. Pepper, cinnamon powder, pickled ginger, chopped peanuts, toasted sesame seeds, pomelo pulp, and (my favorite) crackers or deep-fried flour crisps. Sour plum sauce, rice vinegar, sesame oil, sugar. My friend's dad adds lemon or lime juice for a zesty kick. Jellyfish, chili, sun-dried oranges, parsley. 1. Arrange everything on a big serving platter or tray. Make it pretty: You're celebrating! 2. Gather around the salad, chopsticks in hand. 3. Dive in! Use your chopsticks to raise the ingredients into the air as you recite the blessings. Don't worry where the ingredients fall. Remember, you want to make a mess. 1. Spread out paper plates around the main serving plate/tray so when the salad spills over you're already "serving" yourself. 2. Invest in longer chopsticks, it means the salad won't fall on your hand as you toss, and you can toss further and higher. Gong xi fa cai 恭喜发财 ("wishing you wealth and good fortune") and wan shi ru yi 万事如意 ("may all your wishes be fulfilled") are the most common New Year greetings. You can say this to anyone at any time during the season. Nian nian you yu 年年有余 ("abundance through the year") is said as you lay out the fish, since fish in Chinese is also yu 鱼.
Tian tian mi mi 甜甜蜜蜜 ("may life always be sweet") is said as you drizzle sweet plum sauce over everything. Bu bu gau sheng 步步高升 ("reaching higher levels with every step") is shouted as you lift your chopsticks as high as possible.